Saluting entrepreneur Larry Jacobson, an author, motivational coach, and retirement coach. Larry walked away from a lucrative business and well-established life to spend six years sailing around the world. Why? Because he dreamed of doing it since he was a boy. Now Larry has set sail on a new voyage – teaching others how to follow in his wake. Larry’s “Sail Into Retirement” program is NOT about 401ks, pension plans or reverse mortgages. It is about finding the courage and the commitment to weigh anchor on your old life and begin anew. 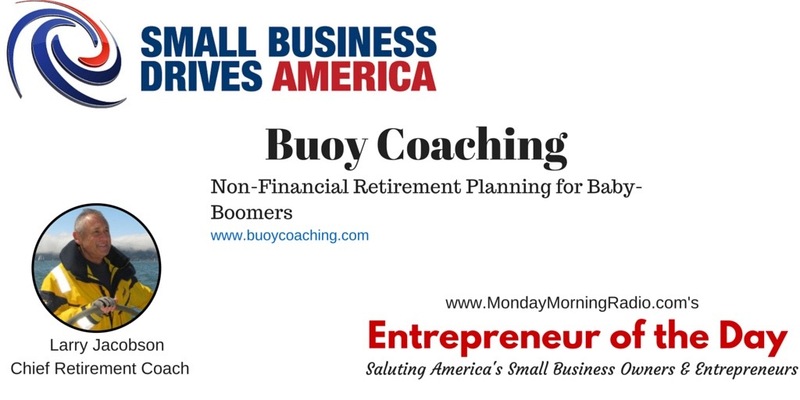 Join Larry and Monday Morning Radio host Dean Rotbart, his ersatz first mate, as they explore the unchartered waters of retirement bliss.